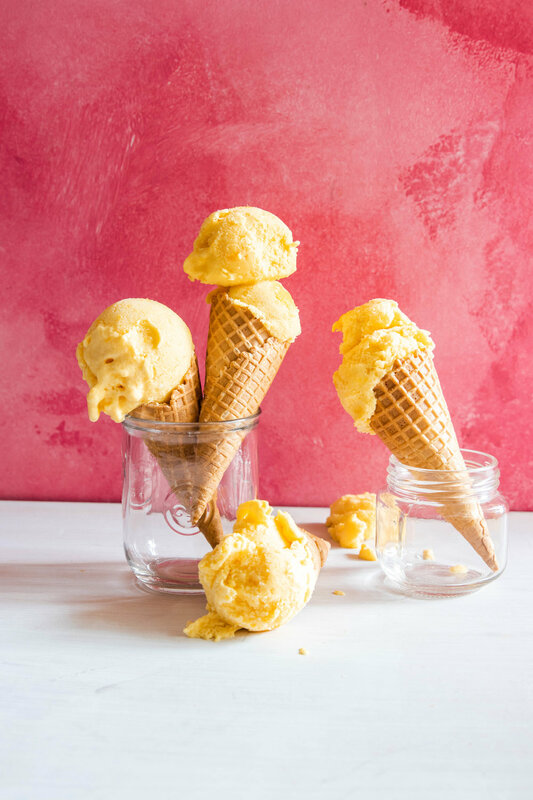 This Vegan Mango Sorbet recipe only contains 4 ingredients! And is so damn easy to make! Instead of egg whites, I whipped up the juice from canned chickpeas to make it super light and fluffy - a cool new vegan trick I learnt. You're going to love the mango sorbet. It's refreshing, it's yummy and it's the perfect healthy dessert for summer. Enjoy! Place frozen mango, maple syrup and coconut milk in a food processor and process until smooth. Transfer to a mixing bowl. In another mixing bowl using an electric mixer, beat the chickpea juice until light and fluffy (around 5 minutes). Add the chickpea mixture into the mango bowl and fold through. Add this mixture into a stainless steel container and cover with plastic wrap. Freeze. When defrosting, only defrost for 10 minutes outside (room temp) before scooping out. Place back into the freezer once done! MANGO POPSICLES! I absolutely love having these by the pool in summer! These are a super simple snack that is healthy and that'll cool you down in that super hot heat! I used @ooborganic frozen mango pieces for this and blended with some yoghurt for a creamy ice-cream texture. Blend all ingredients into a blender until a super smooth paste. Ice blocks can be removed from the moulds and stored in an airtight container in the freezer for up to 1 month. About The Caker: We sell made to order cakes which are wholesome and delicious – not what you get from your average cake store! We focus on ingredients and taste, and all of our decorations are completely natural. …It’s important to eat the best cake in Auckland. Preheat the oven to 180oC fan bake. Line a 22cm cake tin with baking paper, or place 12 cupcake papers in a muffin tray. In 2 lots, add in the flour, ground almonds and baking powder. Add the yogurt and passionfruit pulp, and stop your electric mixer once all the ingredients are combined, do not over mix. Pour the batter into the tin / muffin holes and dot in the mango cubes, pressing them down lightly with a spoon. Bake for approximately 40 minutes if making a cake (or 25-30 minutes if making cupcakes) until golden in colour, springy to the touch and a skewer inserted in the centre comes out clean. Allow the cake/s to cool for around 10 minutes before turning onto a cooling rack. Meanwhile, make the icing. In the bowl of an electric mixer, beat the butter and icing sugar together until smooth, then gradually add the cream cheese, followed by the vanilla. The icing should be smooth, creamy and thick. Stir through the passionfruit powder at the end. Once the cake is cool ice the top of the cake with the icing (or pipe onto cupcakes) and decorate with passionfruit and edible gold leaf. In 2 lots, add in the flour, ground almonds, coconut and baking powder. Add the yogurt and stop your electric mixer once all the ingredients are combined, do not over mix. Bake for approximately 40 minutes if making a cake (or 25-30 minutes if making cupcakes) until springy to the touch and a skewer inserted in the centre comes out clean. Allow the cake/s to cool for around 10 minutes before turning onto a cooling rack. Meanwhile, make the icing. In the bowl of an electric mixer, beat the butter and icing sugar together until smooth, then gradually add the cream cheese, followed by the vanilla. The icing should be smooth, creamy and thick. Stir through the mango powder at the end. Once the cake is cool ice the top of the cake with the icing (or pipe onto cupcakes) and decorate with toasted coconut flakes and edible gold leaf. In 2 lots, add in the flour, ground almonds and baking powder. Add the yogurt and sliced mint leaves, and stop your electric mixer once all the ingredients are combined, do not over mix. Bake for approximately 40 minutes if making a cake (or 25-30 minutes if making cupcakes) or until golden in colour, springy to the touch and a skewer inserted in the centre comes out clean. Allow the cake/s to cool for around 10 minutes before turning onto a cooling rack. Meanwhile, make the icing. In the bowl of an electric mixer, beat the butter and icing sugar together until smooth, then gradually add the cream cheese, followed by the vanilla. The icing should be smooth, creamy and thick. Stir through the mint powder at the end. Once the cake is cool ice the top of the cake with the icing (or pipe onto cupcakes) and decorate with fresh mint and edible gold leaf. In 2 lots, add in the flour, ground almonds and baking powder. Add the yogurt and sliced kaffir lime leaves, and stop your electric mixer once all the ingredients are combined, do not over mix. Pour the batter into the tin / muffin holes and dot in the mango cubes, pressing them down lightly with a spoon. Once the cake is cool ice the top of the cake with the icing (or pipe onto cupcakes) and decorate with lime zest and edible gold leaf.